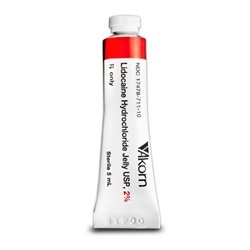 Sterile topical Lidocaine HCI 2% gel in 5ml tube. Aqueous product that contains a local anesthetic agent and is administered topically. The onset of action is 3 to 5 minutes. NDC: 17478-711-10. Manufactured by Akorn. Comes as singles.